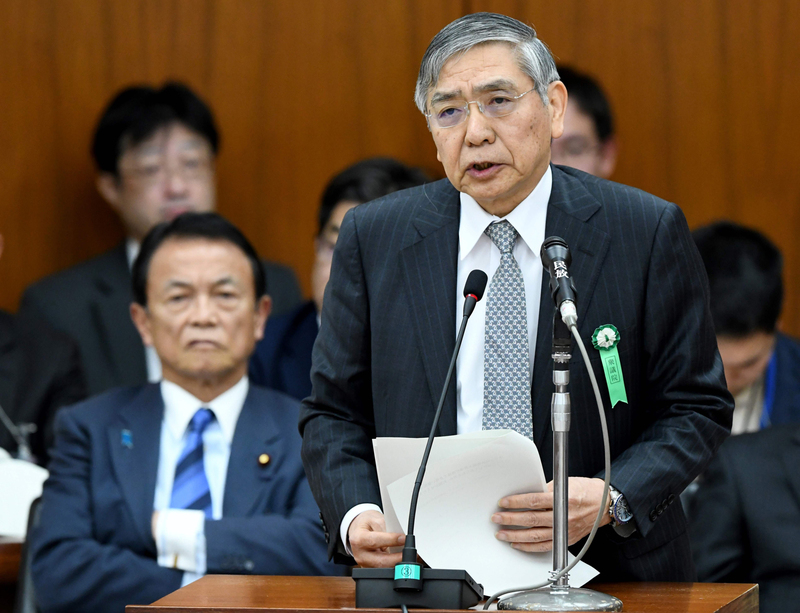 In his first term as Bank of Japan head, Haruhiko Kuroda was a man of bold and convincing action. In his second, he needs to be a man of words, and courageous ones at that. Since 2013, “open-market operations” have been Kuroda’s raison d’etre: firing monetary bazookas at deflation, cornering the government bond market, hoarding 75 percent of exchange-traded funds, driving down the yen. The next few years must be about “open-mouth operations” to influence changes in behavior needed to restore confidence and pricing power. Kuroda already talks plenty, you might counter. Too much, perhaps. Sadly, though, he talks to the wrong audience about the wrong set of problems. To turn things around, to reflate Japan in a bold and convincing way, Kuroda could do worse than borrow from central bankers famed for great linguistic sway — like Alan Greenspan. Granted, the 12 years since Greenspan left U.S. Federal Reserve headquarters haven’t been kind to the one-time “maestro.” His passion for deregulation and monetary largess meant his fingerprints were on the 2008 subprime crisis. But there was something Greenspan did exceedingly well: cajole lawmakers and regulators by actively engaging in the big debates of the day. It started in the early 1990s, when Greenspan helped convince President Bill Clinton’s White House that reducing government debt would unleash America’s animal spirits. It worked, too. U.S. growth soared as long-term yields fell and surpluses mounted. That set in motion a pattern of lawmakers picking Greenspan’s brain, and him speaking truth to power. Kuroda needs to channel his inner honest broker and take the immense gravitas he’s amassed out for a ride. That means using the bully pulpit that only Kuroda possesses at a pivotal moment for Japan Inc.
News that Japan is enjoying its longest growth spurt in 28 years is getting its share of headlines. But so is the dearth of income gains. Rages wages, adjusted for inflation, slid 0.5 percent in December from a year ago and 0.2 percent for all 2017. As a result, domestic consumption is disappointing at a moment Tokyo hoped spending would be surging ahead. It’s high time Kuroda spoke up. Not to the investors or households he’s always trying to convince inflation and better times are afoot. He needs to call out government officials, including Prime Minister Shinzo Abe — those talking big about structural change, but acting glacially. He must appeal to corporate executives’ better angles, making the case for the virtuous cycle fatter paychecks would unleash. Until now, chieftains have piled BOJ’s liquidity into government debt. In fairness, they’ve been waiting for Abenomics to do its part first. Abe, after all, has spent five-plus years promising to loosen labor markets, catalyze a startup boom, rekindle innovation and empower women. Aside from modest tweaks to corporate governance, Abe’s team kicked the can down the road and relied almost solely on BOJ easing and a weaker yen. Yet a little reciprocity is in order. Today’s record profits are as much a product of Abenomics as heady global demand. That’s led to an epic staring contest between Tokyo and corporate leaders. The former say share the more than $2 trillion of idle cash for the good of the nation; the latter party says only after Abe deregulates the economy. Only Kuroda can facilitate a truce — and keep all involved focused. On Oct. 22, Abe called an election he claimed was needed to win a fresh mandate to retool the economy. Yet 118 days on, what’s changed, policy-wise or strategy-wise? Nothing at all. Rather than present a new timeline for reforms, Abe’s full attention is on revising the war-renouncing Constitution. North Korea’s recent exploits, and his Trump bromance, steeled Abe’s resolve — at the expense of competitiveness and productivity. Switching into Greenspan mode could refocus Abe on why voters put him in power in 2012. It would expose the extreme spin gaslighting how little of real substance Abenomics has achieved. The sugar highs from history’s most assertive monetary easing and the world’s biggest debt burden are working for now. So is a uniquely synchronized global growth cycle. Take any of those stimulants away, though, and growth falters anew. Notice that talk of BOJ tapering has quickly given way to bets on additional easing. 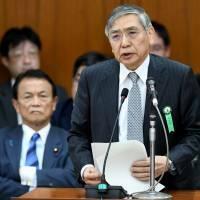 Yet in his second term, Kuroda will confront the same deflationary headwinds. That is, until he learns to channel his inner Greenspan. Kuroda is the highest profile economic thinker in Japan. If only he’d use that status to better, and louder, effect.